Net migration targets should be scrapped after Brexit, the Confederation of British Industry says. Targets should be replaced with a system that ensures people coming to the UK make a positive contribution to the economy, the business group said. Schools and hospitals should receive extra funding where demand is increased by immigration, the CBI added. But the Home Office said it was committed to bringing net migration down to “tens of thousands”. 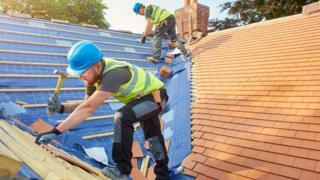 The contribution of EU workers to the UK economy was “profoundly important and will be needed in the future”, after the free movement of EU citizens comes to an end as part of Brexit, the CBI said. It said EU citizens should be registered on arrival to the UK and restrict their visit to three months “unless they can prove that they are working, studying or are self-sufficient”. It would be “entirely unworkable” to move EU nationals into the existing non-EU immigration system, which the CBI described as “highly complex, time-consuming and expensive, particularly for small businesses”. The CBI said immigration had been shown time and again to bring net economic benefits to the UK, yet people had legitimate concerns about the pressures immigration could have on public services and society. The answer was to shift away from numbers and instead to focus on who could benefit the UK. This need not just be high earners, but anyone who could contribute. There is an impetus to overhaul UK immigration policy after Brexit to make sure the system allows skilled people to come into the country from around the world, the CBI said. “The stakes are high. Get it wrong, and the UK risks having too few people to run the health service, pick food crops or deliver products to stores around the country,” it added. However, the Home Office said it had no plans to scrap immigration targets. The target of reducing net migration to tens of thousands was set by David Cameron in 2010. But the goal has never been met, with recent annual net migration to the UK at about 240,000. There is “no consent in Britain for uncontrolled immigration”, the Home Office said. “After we leave the EU, we will end free movement and put in place a system which works in the best interests of the whole of the UK,” the Home Office said. The government has asked the Migration Advisory Committee, a non-departmental public body, to assess the contribution that EU citizens make to the UK. The body has been talking to businesses, the NHS and universities, and is due to bring out a report in September. The government will then set out its plans, taking into account “the UK’s social and economic circumstances and our discussions with the EU around our future relationship”, the Home Office said. The department added that the government had already reached agreements on EU citizens’ rights, while its White Paper proposed visa-free travel for tourists and short-term business travellers.